The Integrated Vinyls plant of RusVinyl in accordance with the start up schedule obtained a trial batch of PVC. On August 03, 2014 at the Integrated Vinyls plant of RusVinyl in accordance with the start up schedule the trial batch of PVC was obtained. Several days earlier RusVinyl obtained the trial batch of caustic soda. Currently commissioning works at the facility are ongoing with further start-up of the object for industrial operation in the second half of the year. Today the Governor of the Nizhny Novgorod region Mr. Valery Shantsev visited RusVinyl in order to see the first ton of the Nizhny Novgorod PVC and to personally congratulate the CEO of RusVinyl LLC Mr.Guenther Nadolny with this very important event for the region. «The project is important both for the region and entire Russia, because it enables us to resolve the problem with import substitution. 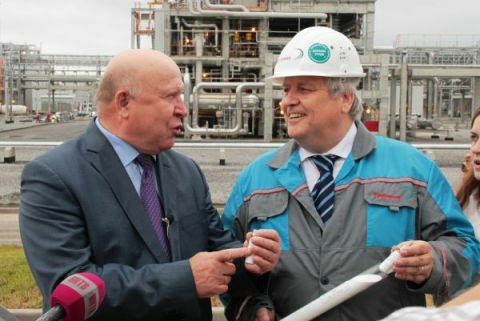 To my mind, after a while a cluster for processing excellent raw materials – polyvinylchloride, that is used in 20 industrial sectors, will be formed around the new complex in Kstovo» - remarked Mr.Shantsev. Guenther Nadolny highlighted once again, that the complex testing of process equipment at production areas is being performed in accordance with the latest schedule. «The plant is in pilot production stage. The quality of the first produced batch is quite high. Currently, precom activities are in progress, once they are over the enterprise will transfer to uninterruptible production mode» - said Mr.Nadolny. After the start-up «RusVinyl will produce 330 kt of high-quality PVC in accordance with the most modern European technology, which ensures ecological and industrial safety of the technological process in the strict compliance with the requirements of the environment legislation of the RF, as well as with international standards in the sphere of ecology and industrial safety. The range of the PVC grades, which will be produced at the facility, are not yet available at the Russian market. Polyvinylchloride is inert, human safe and environmentally friendly polymer, it is used to manufacture a wide range of products, including for the construction and automotive industries, medicine, water supply and other sectors.